The Artist 22E is an update of the XP-Pen Artist 22. The main obvious change is the addition of the Express Keys. The 22 had no Express Keys. (Those are buttons on the outside of the monitor, or sometimes on-screen keys, that can be programmed with software commands). The Artist 22E also uses A+ LED, which has better color quality than the 22. The XP-Pen Artist 22E has two sets of keys, eight on each side, making life equally convenient for lefties, righties, and the ambidextrous. They mirror each other, so there are a total of 8 programmable keys, not 16. These are all on the outside. They are slightly raised. The cords now get tucked vertically in the back. On the XP-Pen Artist 22 Graphic Monitor Tablet they were in a row under the stand. They are now easier to reach. This version does not have speakers. (Installing it, though, may alter the speaker settings on your computer–it did on my Mac–so you may need to go and reset them to continue getting sound from your computer). Since XP-Pen has included an HDMI to Mini Display Port adapter, you don’t need to buy anything additional to use it with a Mac. To install the driver, you have to uninstall all other tablet drivers I had zero problems installing the driver on my Mac. On Windows, the tablet icon that you click to open the driver settings, didn’t appear, but I opened the driver settings in the folder. If you’ve had other tablet drivers on your computer, you’re going to have to uninstall them and all remnants of them–this can be tricky. XP-Pen has a troubleshooting page for driver issues. 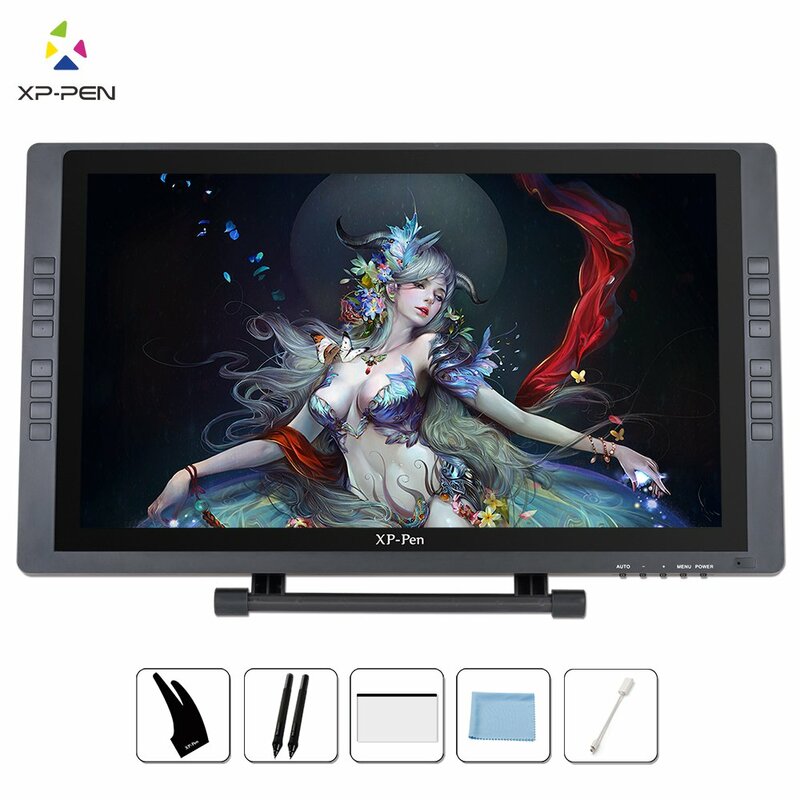 The driver lets you program the Express Keys, adjust your pressure sensitivity, test it by drawing with four colors, calibrate the touch points (4 or 9 points), and rotate the image on the screen in 90-degree increments. It came well-packaged, not fancily, but safely. The accessories are all individually wrapped and put in one box. The box has a handy handle. At around 17 lbs. including the stand and power supply, this (or any) large tablet monitor is not very portable. The handle on the box helps. The attached stand folds up. It’s not terribly heavy to pick up, though I would not want to walk around with it for long. The power brick is not that big. The right- and left-hand columns of Express Keys make this a great choice for lefties. The XP-Pen’s HD screen is bright . The XP-Pen screen is smoother, but isn’t too slippery. It’s fun to draw on. The screen doesn’t get that dark even with brightness turned all the way down. Turning it up increases color intensity. The screen has been measured at 250 nits . The pen squeaks a little on the screen once in a while but not often, and that should go away after a while. There were no dead pixels. There was a little dust on the outside of the monitor. The screen protector had some bubbles that were difficult to get rid of. I also just preferred the feeling of the pen on the screen, so after trying the screen protector I removed it. The pen needs to be charged via USB. A full charge takes about an hour and a half, but 30 minutes is enough to work for quite a while. The company says the pen can go up to 130 hours on one full charge. It has red and blue indicator lights showing when it’s charging or low. The pen has no indentation to grip, but it’s comfortable to hold, and a good weight at 17g–a combination of light enough to not get tired, but giving some balance. The barrel has two buttons. They are easily reachable. The default settings are right-click and erase, but you can change that in the driver settings. The pen does not have an eraser end. The buttons cannot be customized to keyboard shortcuts, but only to eraser and things your mouse does (right-click, etc.). Mac: I tested on Mac El Capitan: Photoshop, Illustrator, Manga Studio, Sketchbook, and the free programs Gimp, Inkscape, Paint Too Sai, Sculptris, and Krita. The pressure sensitivity worked great in all of them (I am not that familiar with Sculptris, a free 3d program, so I was not sure what to expect but the pressure did make a difference). As expected, the pressure sensitivity doesn’t work in Illustrator; so far, Wacom Cintiqs and Intuos Pros have the monopoly on that. The pressure also, as expected, doesn’t work in the Inkscape calligraphy brush, since Inkscape is similar to Illustrator. You can still use the tablet in those programs, without pressure. Pressure sensitivity worked in vector layers in Manga Studio Pro, so you can draw in vector with this. Windows: On Windows 10 I tested Photoshop, Gimp, and Sketchbook, and got the same results–works great. There are basic controls on the bottom right. There are no speakers in the monitor, and when you attach it, you may have to change speaker settings to get sound in your computer as it may change the settings (this did happen and it’s on the XP-pen.com ). The driver settings let you test and adjust pen pressure, calibrate the screen to the pen, and set up the Express Keys. On the bottom there are controls to adjust brightness, bring up the menu that allows some color adjustments, and the power on/off. Out of the box, the Express Keys are on default settings that work in all programs. You can reprogram them to your favorite keyboard shortcuts using the driver settings. The pen’s two buttons are programmable as well, to mouse commands such as right and left-click, and eraser. Here’s a pen test showing pressing down harder and softer in Photoshop CC. I’m working on some more video. Me drawing curlicues on the XP-Pen Artist 22E. You can see the pressure sensitivity at work. Have to say I really enjoyed the XP-Pen Artist 22E for drawing. The lines are fluid, the pen sensitive. I adjusted it to a bit higher in pressure as it’s very sensitive at the lower areas. The driver, which Ugee and XP-Pen developed together, gives a springiness to drawing. XP-Pen (the company) also used to work with UC-Logic (the company), but no longer does. Tip: On a Windows 10 computer, some programs, including Photoshop and Sketchbook, require “supports digital ink” to be ON in your PC tablet settings in order to get pressure sensitivity. In Photoshop, remember to have Brush Shape Dynamics turned on. There is a little parallax because of the glass. No jitter whether drawing forward, back, or faster I didn’t experience any hover issues. I can’t find much to complain about. It works well and is great to draw on. This is a good professional or starter pen tablet monitor. It doesn’t have every feature of the Cintiq, so the decision should come down to how much you need those additional features. Customizable keys increase efficiency, but you can draw without using them at all if you prefer, or just use some. This XP-Pen Artist 22E Drawing pen Tablet review is a thumb’s up. The color is bright and vivid, and it gets most of the Adobe RGB. This is a great tablet if you want a large, responsive drawing surface to create digital art.